This week, I have the privilege of being here in Minneapolis at the Desiring God conference for pastors, led by John Piper. 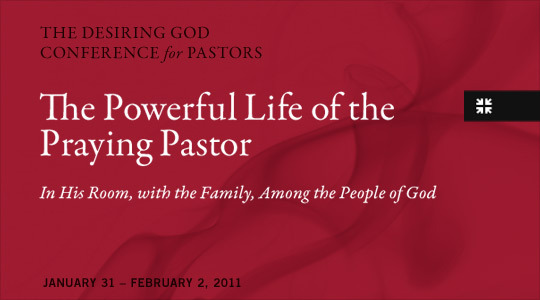 The theme this year is “The Powerful Life of the Praying Pastor”, with an emphasis on prayer. I’m here with all the pastors from our church, along with about 1,800 other pastors from around the country. We had a long drive here today from Janesvile, WI, especially as the snow was starting to fall in what they’re saying could be one of the biggest blizzards in years! But, we made it here safely, and in plenty of time for the first session tonight. The conference kicked off with a time of worship led by the team from Bethlehem Baptist Church, Piper’s church here in Minneapolis. The group of pastors, mostly men, sang with full voices on the familiar songs and hymns that were chosen, reminding me of Promisekeepers event from years ago! The speaker for Session One was Joel Beeke, and he spoke on “Cultivating Private Prayer as a Pastor”. Joel is the president and professor of systematic theology and homiletics at Puritan Reformed Theological Seminary, and pastor of Heritage Netherlands Congregation in Grand Rapids, MI. Beeke’s opening message on prayer was so good! He challenged us to not fall into the trap of prayerless praying, but the need to live a life of private prayerful praying. He challenged us with stories of the prayer life of several heroes of the faith like Martin Luther, John Calvin and others. They devoted so much time to private, powerful prayer and to their own personal time with the Lord. Today, many people see prayer as an appendix or interruption to our work as a pastor, rather than the foundation. He said the goal isn’t necessarily longer times of prayer, but quality times of prayer. One thing he said that really stuck out was “if we don’t draw near to him in private, when we pray in public, we’ll be lacking in content, heart and passion.” That’s so true! If we’re to live a life of private, prayerful praying we need to take hold of ourselves and take hold of God. To take hold of ourselves, we need to remember the value of prayer, maintain the priority of prayer, pray with sincerity, cultivate a continual spirit of prayer, work towards organization in our prayers, read the Bible for prayer and keep a balance in our prayers. To take hold of God, we need to plead God’s promises in prayer, cling to the glorious Trinity in prayer and believe that God answers prayer. He expounded on each of those items with some practical tips in each area. He said we should never engage in any activity in ministry without praying first. We need to put prayer first in our priority list, and plan prayer into your schedule throughout the day. Also, whenever you have the least impulse to pray, then pray right then. As you read the Bible, pray God’s Word back to Him. I’m looking forward to hearing John Piper and Francis Chan speak tomorrow, along with others. You can actually watch along from wherever you are on the livestream from the conference tomorrow! I’ll try to post again tomorrow night with a recap.